Check out starlooks.com for more info on how to purchase their individual product such as the ones that were sent in my box, or you can subscribe to the $15 Starlooks Starbox and try out the whole line a little bit each month. I am wearing the eyeliners and blush today and love love love them !! 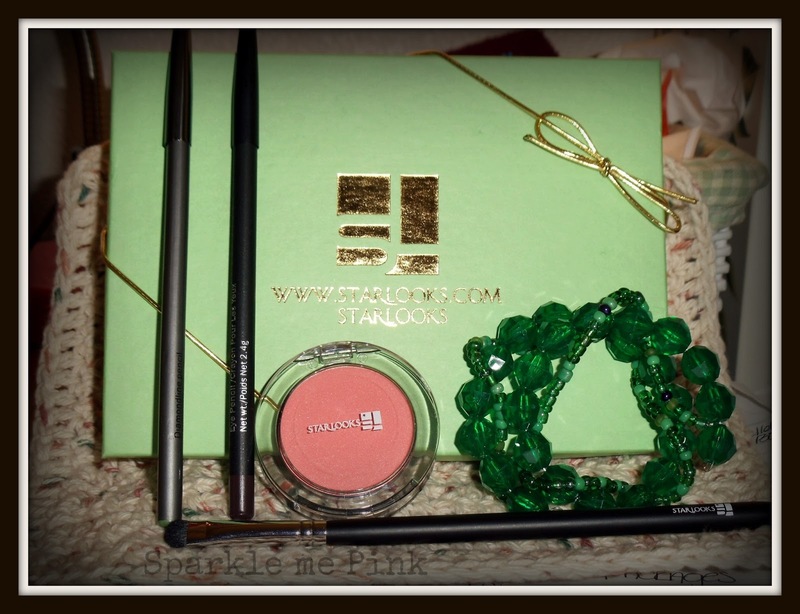 The blush is such a soft beautiful warming color and the eyeliners are definetly of a higher quality than I am used to. Like I said in the video Sophia literally came in my room that evening and hijacked my bracelet - such a girly girl that one is. OH and I used the dome smudge brush to smoke out my eyes in my nail tutorial video HERE so check that out. Starlooks Starbox did send me this box for reviewing purposes. I am not paid for making any of my videos or blog posts. I love the Starlooks Star box. I want !!! I did not even know about starlooks, I am going to have to try this out! Thanks for sharing! Hadn't heard of this - sounds amazing! thanks. Ok, fess up where the heck do you find one of these awesome boxes. I have never heard about Starboxes, but I could totally get into that. It's like Christmas every month in your mailbox! I love it ! these subscription boxes - especially the wantable.co and starbox ones are super addictive !! Subscription boxes seem to be very popular lately! I've never gotten one but it's a cool idea. Oooh! Another new product for me to try! I've been wanting to try Glossybox too ever since they came to the states, thanks for your review. A lot of really great products! I really like the Diamond pencil. So pretty! Thanks for sharing! The makeup looks so pretty, even the packaging is beautiful. I would love to try that blush.